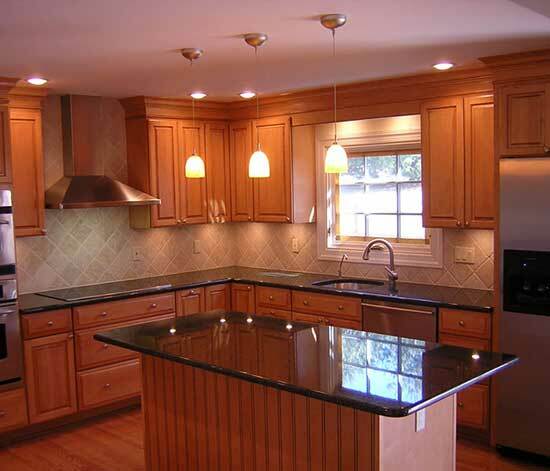 Racine Roofing and Remodeling provides Kitchen Remodeling services in Racine, Kenosha, Sturtevant, Caledonia, Milwaukee, and Franksville, as well as all over Wisconsin. A well equipped kitchen is fundamental to the comforts of home, and there are many ways to achieve this in your kitchen remodel. We will help create the layout that is right for you, including choices such as one-wall, galley (utilizes your vertical space), L-shape, horseshoe, peninsula, and island. Each option has its own advantages, so that you can perform wonders in your kitchen. We optimize a 70 year old kitchen trick that is called the work triangle, which says that your sink, stove, and refrigerator should be no less than 4 feet and no more than 9 feet apart. Also, consider creative storage ideas for cabinets, because we know you have lots of pots, pans, and other gadgets to store when not in use, and the layout will take account of your large appliances. We will pull out all the stops to upgrade the heart of your home. At Racine Roofing & Remodeling, we will consider your cabinets, flooring, appliances, lighting, backsplash, plumbing fixtures and hardware, accents, and countertops in any remodel we do for you, whether large or small. Two great choices for your countertops are granite and quartz. Granite is an American favorite and is chemical resistant, stain guard protected, radon/radiation tested, and equipped with thermal stability. Quartz is a countertop surface that features a consistent pattern available in many colors, scratch resistance, scorch and stain resistance, and strength and reliability. The hub of the home, this kitchen has evolved into a versatile room to prepare food, entertain guests, and share meals. If you’re looking to do a kitchen remodel, keep in mind that a successful kitchen design needs to blend functionality with personal prerequisites. You can bring continuity to your home by designing the kitchen in the same theme as its exterior architectural style, but whether your preferred style is traditional, luxury, transitional, contemporary, country, or anything else, we have the expertise to set you up with the kitchen you deserve.